That extra weight is depressing you! It is also putting you at risk of all sorts of health problems. Heart disease, stroke, various cancers, diabetes and gout are all more common in the overweight. Think of fat as ‘energy stored’. It is the result, in simple terms, of taking in more energy than we burn up. The excess energy is the stored as fat. This ability to store energy is very useful when food supplies are erratic. We can eat plenty when the harvest is in; and store the excess as fat to carry us through the long months of winter when food is hard to come by. This weight cycling, as it is called, is what kept our ancestors from getting too fat year upon year: they gained a little in summer and lost it again through winter. Affluent societies do not have weight cycling, because food is plentiful all year round. 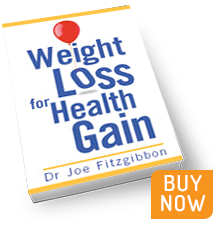 This predisposes us to weight gain year after year, and that is how most overweight people end up with unwanted flab. A tiny error in calculation can result in big weight gain. For example, if you consume just one tablespoon of olive oil, or two tablespoons of yoghurt, above your daily energy (calorie) requirement, you could gain one stone in weight over the course of just one year! But the simple mathematics don’t always pan out – there is more to it than that. Some folk have very thrifty metabolisms and gain weight ‘just looking at food’. Apart from hormonal disturbance, It is possible that some of them have metabolisms that are influenced by the type of foods they eat, not just the quantity. Are you ready to take a fresh look at your diet and weight? Let’s get started! Suite 31, Galway Clinic, Doughiska, Galway, Ireland, H91 HHT0. Clinics on Monday, Wednesday & Friday. Suite 21, Hermitage Medical Clinic, Old Lucan Road, Dublin 20, D20 W722. Clinics on Tuesday & Thursday.